For a bit of time now, all my creative efforts have been steered in two directions: 1. planning two parties that were happening within a week of each other, and three states away from my home; and 2. making my first quilt as a baby shower gift (this baby shower being one of the parties I planned). Hence the reason why all has been quiet on the blogging front. Now that the parties are over, the quilt has been given and I’m caught up with laundry (ha! ), I can blab all about it! If you follow me on twitter and instagram, you might have gotten a sneak peek or two, but now I am showing it off in all its glory! I can’t say I’m a quilt enthusiast, but I have a few quilts on my sewing bucket list: sorority t-shirt, son’s baby clothes, and now daughter’s baby clothes. Really just ways to be able to see and use all these things I’m hanging on to. But I’m not a ‘tradaditional’ quilt kind of girl. 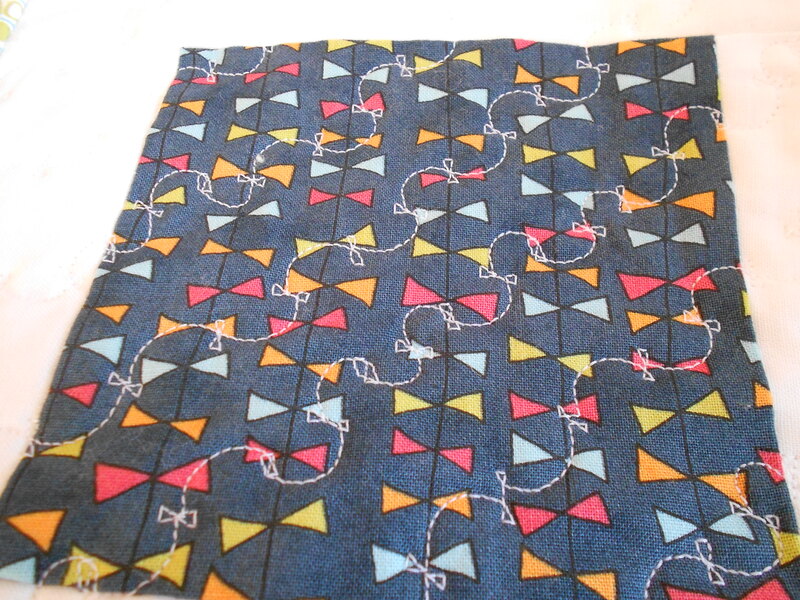 So I started looking into more modern quilts where the designs are simple and clean and the fabric is shown off and I don’t have to slice and dice it into tiny squares. Who has time for that anyway? 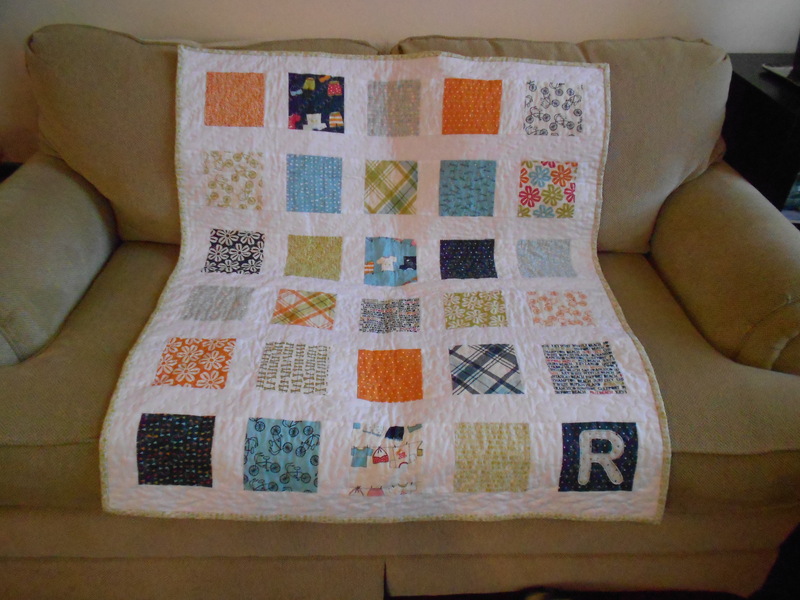 And when I got the news that my brother and sister-in-law are having a baby, I thought it would be great to make them a quilt, because every baby needs something handmade, no? When I found the Lucy’s Crab Shack collection by Sweetwater (for Moda fabrics), I knew I had to do it. They love the whole beachy/kite thing. This ‘pattern’ is about as easy as a quilt pattern gets. I had this idea in my head, but found this tutorial that was exactly what I wanted, only I used a 1/4 inch seam allowance. Using precuts made it so easy. It keeps me from doing too much cutting and too much math. My quilt was six rows of five charm squares, instead of six rows of six squares like the tutorial because there were a bunch of pink squares in the pack, and that wasn’t going to fly. One cute thing I did was put the baby’s last name initial in one of the squares. I used my Slice to do it. I got it months ago and still hadn’t used it, so I was excited to give it a try. I like it! I’m thinking some initials on coffee cuffs might be coming up soon. What do you think? After I cut out the letter, I stitched it onto one of the charm pack squares, just inside the cut line. 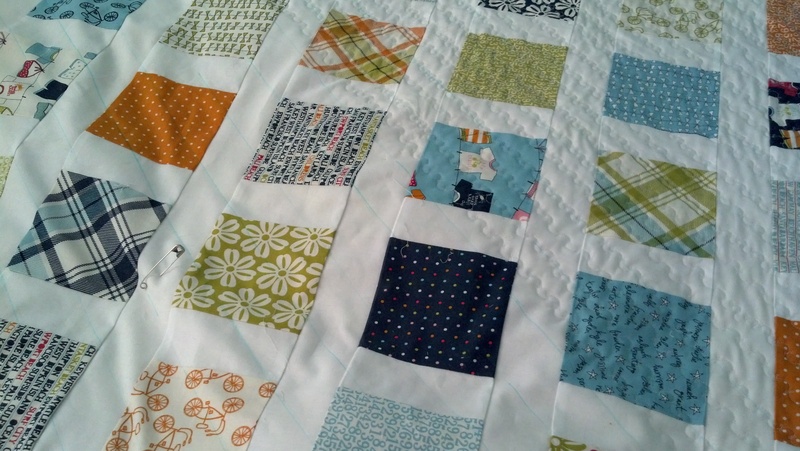 As the quilt gets washed, it will fray and fluff a little and give it even more texture. I’m excited to see how it ‘ages’ with time and a baby using it. After my quilt top was sewn, it was time to contemplate the actual quilting of the thing. Since it’s my first quilt, I thought quilting it with straight lines on the diagonal would be a safe bet, but I wanted that crinkly feeling that free-motion quilts have. So I started looking at the fancy stitches on my machine to give it more ‘movement’ and lo and behold, my machine has a stitch that looks like a kite tail! How perfect is that for this quilt? To keep track of my lines, I laid out my quilt and made diagonal lines on it with a water-soluble fabric marking pen. It’s a bit unnerving to take a blue marker to white fabric, but I promise it comes out! Then I took the whole thing to the machine and started stitching. After a little bit, I thought I needed more rows, so I went back and sewed in between my original lines as well as on my lines. I think I ended up with stitch lines about every inch or so. It was tricky getting that much fabric around, but rolling it up on the sides helped. I think a walking foot is in order, but I’ll chalk up any imperfections as ‘charm’. This is definitely not factory-made. Here it is half-quilted. If you look very closely, you can see the blue lines on the left side. It looked so awesome when I was done, but now I had to bind it, which was the part that scared me the most. Luckily, one of my son’s classmate’s mom is an amazing quilter and agreed to teach me this final step. I was really excited to learn until she told me I had to hand-stitch this thing. What?!?! But I’m always up for learning something new, especially if it’s sewing-related, so I figured I’d hand-bind it this time and see if I liked it. I can’t say that I did. It’s really simple to do, but it just takes too long. Seriously. I had a 12-hour car trip and still didn’t get it done (I didn’t stitch away the entire time, though). I barely got it done in time for the baby shower. A big part of me wanted to just glue it shut and be done with it, but the crafter in me wouldn’t go for it. 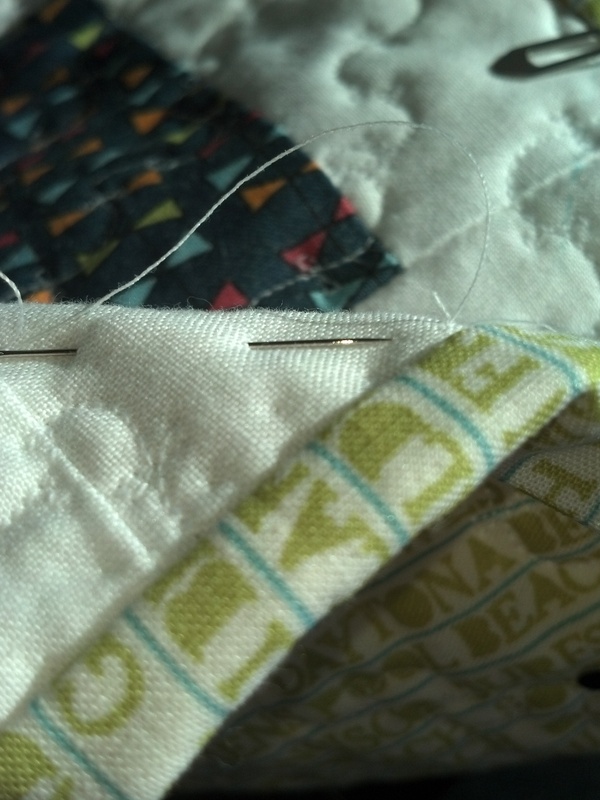 However, I will admit that it is a nice, clean way to finish the quilt if you take your time. 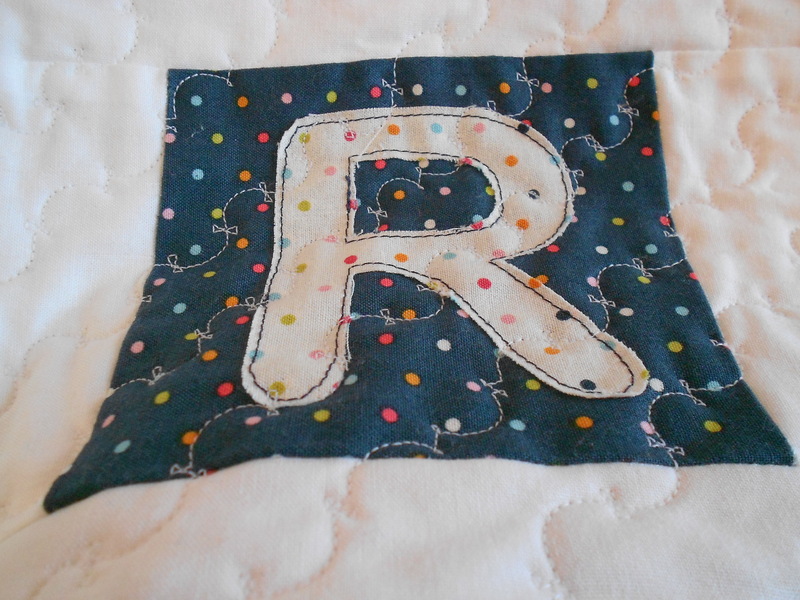 When I was finally done, I rolled it up so that the “R” showed, and tied it with a torn strip of the backing fabric so it would be all frayed and cool-looking. I am so glad I took the plunge and made this quilt, and I’m glad that my first quilt will be for my soon-to-be nephew. It was fun to make, I got up close and personal with my machine, made a new friend and made my sister-in-law cry. I think that’s a win on all fronts! 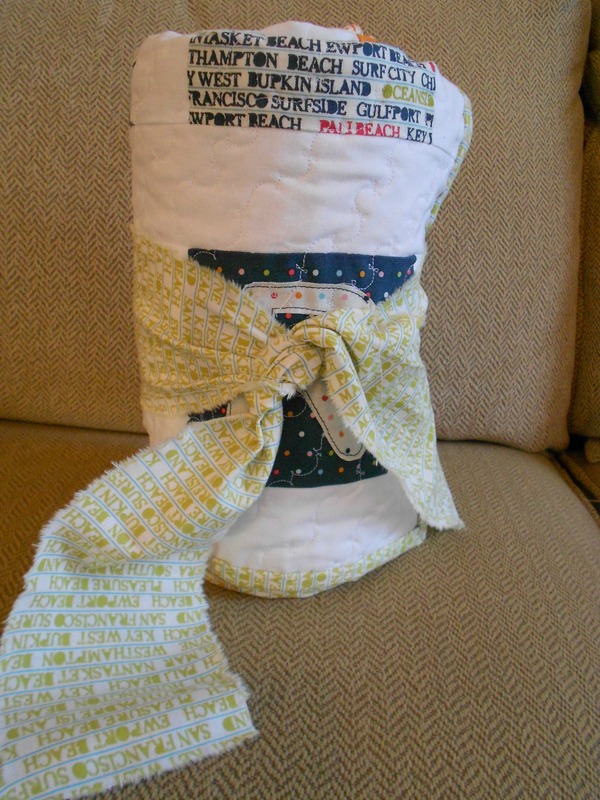 This entry was posted in Handmade, Sewing and tagged baby quilt, quilting, sewing on May 2, 2013 by aliciamariel.